HIGH-FLYING Manchester City were given the run-around by a Grimsby side who ended their 10-hour goal drought and easily did enough to secure all three points. The Mancunians, second in the First Division, took an early lead, but were quickly pegged back and then humbled by a side hovering just above the relegation places. Midfielder Alan Pouton was the Grimsby hero, hitting the Mariners’ first goal in 628 minutes of play. Spencer Prior put City in front after five minutes with his second goal since moving from Derby. He outjumped the defence to head home after Richard Jobson nodded Mark Kennedy’s left-wing free kick back across the goal. Grimsby keeper Danny Coyne then pulled off a flying save to keep out Jeff Whitley’s rising 20-yard drive as City appeared set for a comfortable afternoon. Their advantage was short-lived, however, as Pouton volleyed home in the 16th minute, latching on to Kevin Donovan’s cross and sparking delirium among the home fans. The catalyst for the goal – Grimsby’s first since a 1-0 win over Wolves on March 7th – was striker Lee Ashcroft’s determination to run at the City defence and Prior in particular. 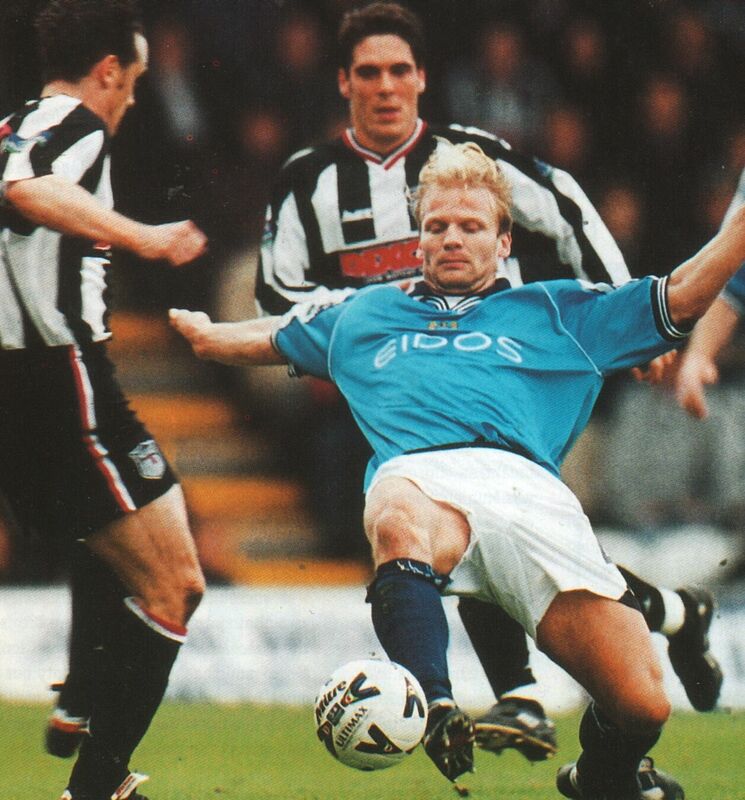 He beat Prior to the byline and supplied a delightful cross that Nicky Weaver fingertipped and then saw defender Richard Edghill clear only as far as Donovan, whose cross was flicked towards Pouton by Daryl Clare. Overall Grimsby looked the classier side, with their fast-flowing, yet composed brand of football. 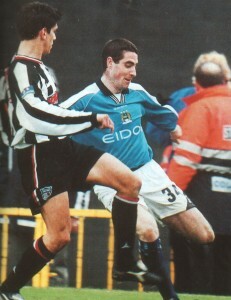 Ashcroft was a constant source of concern to the City defence. The visitors lacked wit and imagination and all too often relied on the long ball to Shaun Goater. Not even the introduction of Ian Bishop could regain the initiative for City . Another substitute, Grimsby’s Steve Livingstone, had a glorious chance to put his side ahead midway through the second half, breaking clear after a defensive mix-up, but his shot lacked power and Weaver saved with his feet. Grimsby were clearly in the ascendancy for much of the second half and Jobson denied Ashcroft with a last-ditch tackle as the forward prepared to shoot. The most controversial incident occurred seven minutes from time. Donovan burst clear on to Ashcroft’s well-flighted ball but went down under the challenge of Danny Tiatto outside the box. The referee ignored the calls for Tiatto to be dismissed and let play continue, to the consternation of the home fans. Livingstone again went close in stoppage time but there was still a chance for Kennedy, again City ‘s most dangerous performer, to grab what would have been an unjust winner. 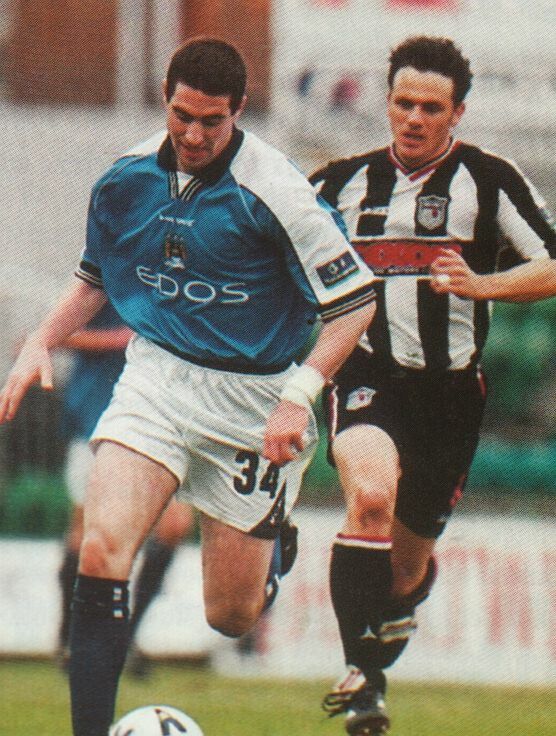 But his close-range effort was kept out by Coyne. Joe Royle, the Manchester City manager, was quick to admit that his side was fortunate to leave Blundell Park with a share of the spoils. “We started strongly but switched off after we had taken the lead,” said Royle.